ISOMA's premium-quality 3-Piece Specialty Brush Set consists of three premium-quality brushes that are ideal for the multi-media makeup artist to have in their makeup case. Specialty brush # 1 is used to apply adhesive to the skin for various adhesive application needs. Specialty brush # 1 and # 2 are used to dissolve and blend various size edges of plastic bald caps. They may also be used to losen the edges of bald caps, prosthetic appliances, and other items. 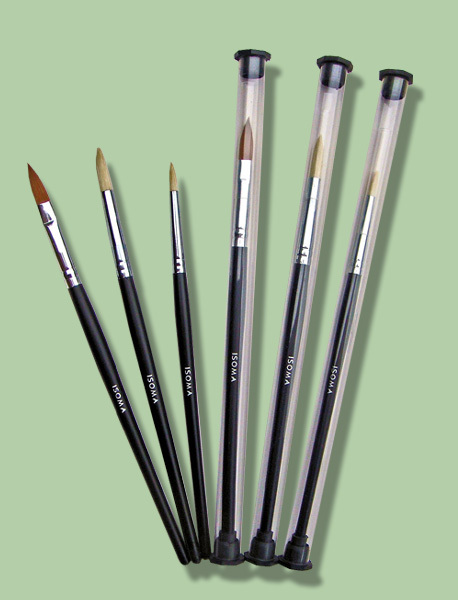 Each of these premium-quality brushes features the ISOMA name in sliver on a black brush handle. The 3-Piece Specialty Brush Set comes in three individual see-thur plastic protective holders and are only $24.00. Next to the makeup artist's knowledge, expertise and skill as a professional, one's application tools and products are essential to the success of the makeup application. 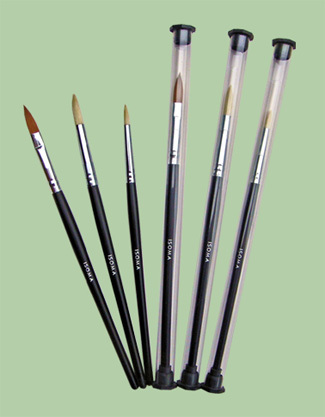 In reference to brushes as application tools, the quality of the brush materials used, their construction by skilled craftspeople, the shape and design of each different brush and the type of natural hair or nylon fiber that are used in ISOMA brushes are essential to the successful performance of the brush and the artist's flawless creation. The wood of the pear is one of the preferred materials in the manufacture of high-quality woodwind instruments, fine furniture, and artistic carvings. The handles of ISOMA brushes are also made from the hardwood of the pear tree. The metal part of the brush that binds the brush hair to the handle is made of nickel-plated brass ferrules. ISOMA has selected a variety of natural hairs (red sable, weasel, squirrel, badger, goat, raccoon, horse, and boar,) for specific uses of its various brushes. Only nature's highest quality natural hairs from these species are selected for softness on the skin and their ability to superbly perform the application function. Also, high-quality nylon filaments are the preferred choice of material for brushes that are to be used with cream and liquid products. ISOMA's brushes are tapered at the ends to provide flexibility, ease of application and the desired results. 1. Specialty brush # 1 (classic Size) . . . This is the perfect brush for applying adhesive to the skin for a variety of uses (lace hairpieces, prosthetic appliances, plastic or latex bald caps, feathers, glitter, etc.) It features a long useful handle to enable a firm grip and easy application. The brush head possesses a plump tuft of absorbable hair, but yet it is firm and durable enough to hold an ample amount of adhesive and last through repeated uses. The brush design gives the makeup artist the ability to control and smoothly apply the adhesive to the exact area of the skin or application area. Specialty brush # 1 is 7 3/4 inches long. 2. Specialty brush # 2 (large size) . . . This large size specialty brush is made of strong boar's hair and is ideal for holding a larger amount of the liquid that is used to dissolve the edges of a plastic bald cap. It is also excellent for "rolling off" large areas of excess edges of the plastic bald cap, by the use of the specially selected coarse boar's hair and the rounded brush head design. And it may be used to loosen the edges of the plastic bald cap for the removal process. Additionally, this brush may be used to lightly loosen small edges of other items (lace hairpieces, prosthetic appliances, feathers, glitter, etc.) 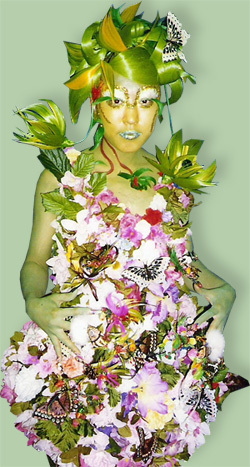 that have been adhered to the skin. Specialty brush # 2 is 7 3/4 inches long. 3. Specialty brush # 3 (small size) . . . This smaller size specialty brush is made of strong boar's hair and is ideal for holding smaller amounts of the liquid that is used to dissolve the edges of a plastic bald cap. It is also excellent for "rolling off" small areas of excess edges of the plastic bald cap, by the use of the specially selected coarse boar's hair and the rounded brush head design. And it may be used to loosen a small edge area of the plastic bald cap or all edges for the removal process. Additionally, this brush may be used to lightly loosen small edges of other items (lace hairpieces, prosthetic appliances, feathers, glitter, etc.) that have been adhered to the skin. Specialty brush # 3 is 7 3/8 inches long. The 3-Piece Specialty Brush Set Holder is a see-thru plastic holder that is closed at both ends with a black closure cap. On one end of the closure caps is a special holder in the base that holds the tip of the brush handle in place. This type of holder prevents the brush from moving once it is placed in the see-thru plastic holder. The holder is cleanable with a soft cloth and a mild cleanser. It should not come into contact with adhesives, adhesive removers, acetone, etc., as these type of substances will scar or mar the plastic surface area of the holder. If properly cared for, the holder will help to keep your brushes in an orderly manner and well-maintained condition. The brush holder is 9 1/4 inch long (from closure tip to closure tip) and is 1/2 inch round. One may also use a good quality hair shampoo to clean their brushes. However, avoid a shampoo that contains any kind of oils, glycerin or heavy conditioners. Such products tend to soften and make brushes feel greasy and less fluffy like real hair does if it was not rinsed well and still contains too much shampoo or conditioner in it. Make sure you rinse your brushes very well. When using this method, place a small amount of shampoo (that has been semi-diluted with water) in the palm of your hand and gently stroke the brush back and forth over the shampoo to permit the shampoo to be absorbed into the hair and cleanse the hairs of the brush. Do not let the shampoo get into the metal ferrule area of the brush. After cleansing, gently rinse your brushes well under clean, lukewarm running water. Then use cool water as a final rinse water. Afterwards, gently blot the brush with tissues or a soft folded paper towel to remove any excess water. Finally, shape your brush hairs into its normal shape and permit the brush to dry by placing your brush over the edge of a counter or table so the brushes can dry as quickly as possible in an even manner by permitting the air to circulate around your brush hairs.